Family holidays in Dubrovnik can be amazing if you make sure that everybody enjoys. Travelling with children to Dubrovnik is a great idea, since there are numerous activities ideal for your little ones. Dubrovnik's Old Town is a car free and therefore ideal for children who can walk freely on the streets. One of the attraction for children is Dubrovnik's Aquarium. It is situated within the walls of St John's Fortress and shows diverse Adriatic sea flora and fauna in 31 aquarium tanks. Children can see many kind of fishes as well as starfish, sea urchins, sea cucumber, shells and crabs. Walking along the city walls will be unique experience for children. They will enjoy exploring forts and bastions, seeing boats passing by the walls. A cable car ride to the top of Mount Srdj is another option of keeping your children entertained. Once you get there, they will love looking the city walls, the island of Lokrum and surrounding area from the bird's eye view. 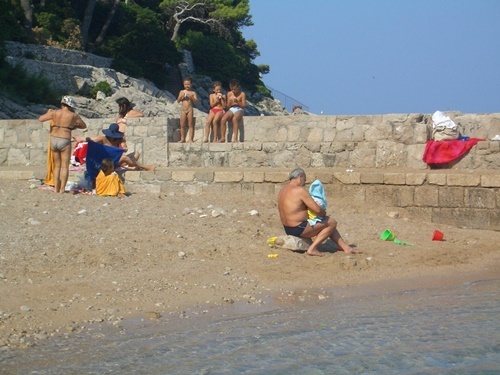 Dubrovnik has numerous beaches which are suitable for children. The most popular among them is Copacabana beach in Babin Kuk. The beach has aqua park ideal for children amusement. Babin Kuk is a touristic area of Dubrovnik whose Mediterranean greenery, great beaches and walking paths makes it ideal place for a summer holiday. Another great beach is the one beneath Hotel Valamar Dubrovnik President, which is equipped with deck chairs, parasols and changing cabins. Sandy beaches are pretty rare in Dubrovnik area. The most popular is Sunj beach which is located on the island of Lopud. This beach with shallow waters is great for children and they will love swimming, snorkelling and building castles in the sand here. The island of Lopud can be reached by regular boat from Gruz port in only 1 hour. If you wish to explore all three of Elaphite islands the best would be taking a day boat trip on a historic galleon. The island of Lokrum is another popular destination among families. It is located across the Old Town and can be reached by boat from city harbour in only 15 minutes. This green island is perfect for a relaxed day trip from Dubrovnik. On the island you will find a sea lake (Dead sea) ideal for small children. Lokrum is also a home to an unique botanical garden in which grew 500 different kind of exotic plants. A visit to adventure park Cadmos Village, situated south of Dubrovnik in Konavle, will be a true excitement for the whole family. This adventure park has a tree terrace, 7 meters high, which provides stunning view over the Konavle valley. There is also a restaurant near the treehouse where you can enjoy home made meals. You can also try 4 zip lines, a giant swing, sack jumping, pulling the rope. You can also practise your skills in archery, slingshot and paintball. Where to stay with children in Dubrovnik? When choosing where to stay in Dubrovnik during your family holiday you may take in consideration suburbs of Lapad or Babin Kuk. Lapad is touristic area with numerous apartments and hotels settled in green Mediterranean surrounding. Here you will find a promenade, many outdoor cafés, ice-cream shops and restaurants, children's playgrounds and numerous beaches. Babin Kuk offers accommodation in numerous hotels from which you can easily reach great beaches. We can recommend Valamar President Hotel, situated at the tip of Babin Kuk peninsula. Great hotel for family holiday is also Valamar Club Dubrovnik which offers all inclusive deals. This hotel has an outdoor children pool as well as kids club with fun activities for young guests. You may choose to stay at the Sun Gardens Dubrovnik, located 13 km northern of Dubrovnik in the village of Orasac. This is a beautiful resort with a great amount of facilities including indoor and outdoor pools, tennis court, playground and kids klub. Beneath the hotel there is a beautiful beach ideal for children.